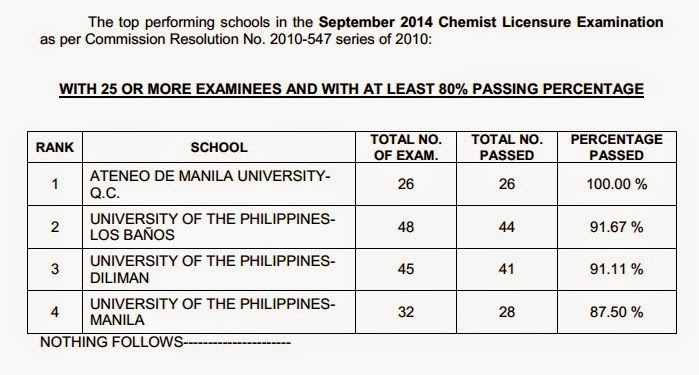 September 2014 Chemist board exam results are released in nine (9) working days after the exam. The Professional Regulation Commission (PRC) named a total of 421 out of 705 who have passed the exam given by the Board of Chemistry in Manila. According to PRC, Ateneo de Manila University (ADMU) is the top performing school for its 100 percent passing rate or 26 out of 26 examinees passed the exam. University of the Philippines - Los Banos (UPLB), University of the Philippines - Diliman (UP-D) and University of the Philippines - Manila (UP-M) are among the top performing schools - 91.67, 91.11 and 87.50 passing rate respectively.